Discussion in 'News and Results' started by Baltipal, Aug 23, 2009. Many thanks to the Sywell team for their excellant Course today, it's much appreciated by all of us I'm sure. Also by extention I'd like to reiterate my appreciation to all the Clubs that have looked after us this Season & made it possible for us to participate in this Sport of ours, Cheers lads & lasses! Thanks also to David & Andrew for their company today & their support while I was having such a difficult time, I'm sorry if I appeared to be abit grumpy at times, you two were always great company & I have alot to learn from you. 17 today from me & damned lucky to get that! My Achilles Heel is exposed windy targets so Sywell isn't my ideal venue but I recognise how essential they are to the circuit as a whole. Congratulations to Andy Gillott for the Season & Andy Calpin for the day. The former for achieving this accolade despite an injury that must have been very uncomfortable. Our own Ian Stoddart took A Grade & I think we finally wrung a smile out of the bugger, well done mucker. Also Millride's Roy Boliver got second place in C Grade, well done that man! Good end to GP series , well done Sywell & all the organisers. Well done to the Steyr Velociraptor Andrew Gillott on his win ! Cool good news well done team Walther,must be a bitter pill for some to have to take. Whats Walther giving you each,a Carbontec . Just to add my thanks on here now i found out how to! Great day though "testing" ! Thanks to all for gp9 and the others i managed this year, hopefully one year i will make all 9! Thanks Rob, you dont need me to tell you yours are great too as we a both great photographers. All i want to know is why i cant shoot a gun like you lol! Well done to both Andrew and young John for 1st and 2nd in AA. nomination before the shoot starts of wild card shooters has been mooted. To top it all, I just noticed i scraped my way into the showdown! And well done to TEAM WALTHER on the constuctors title ..
Well done to all who took part Over the summer and gave time to organise. What a GP season that was! Probably the most challenging I have shot. Big thanks to everyone involved with the running of this years comps, I know it takes a lot of time to do these things and it isn't always appreciated. Hope to have photos up soon. Well, it all came down to the last GP in the season to settle everything. It could all be won or lost on the day. Those familiar with Sywell know it's a course with a very tricky and baffling breeze. Those unfamilair with it could be at a disadvantage. However the Sywell wind had it's own idea and decided to level the field with a 20-30 mph gale. Unlike Millride though, it stayed dry and sunny, so the tears were all the more visible. Gusts of 20mph varying 5 mph per second troubled many shooters including myself, robbed others and left many by the wayside. The normal stable FT position was tested on several lanes, with many shooters using a full 2 mins while they struggled just to hold the plate in their sites. Many courses are tricky, some steal a shot at every opportunity, some require a stiff resolve, some require a determined fight, yet Sywell seemed to just punch back as hard as you fought it. A foot of windage? 5mm short. Give it less? Not enough. Go to the edge in a lull? Too much. A lull? Pushed out. Target after target, lane after lane, shooters were drawn into themselves as they wondered just what they had let slip through their fingers. It was mooted it was a random course, and it's true, some suffered almost uncharacteristicly or perhaps unfairly. 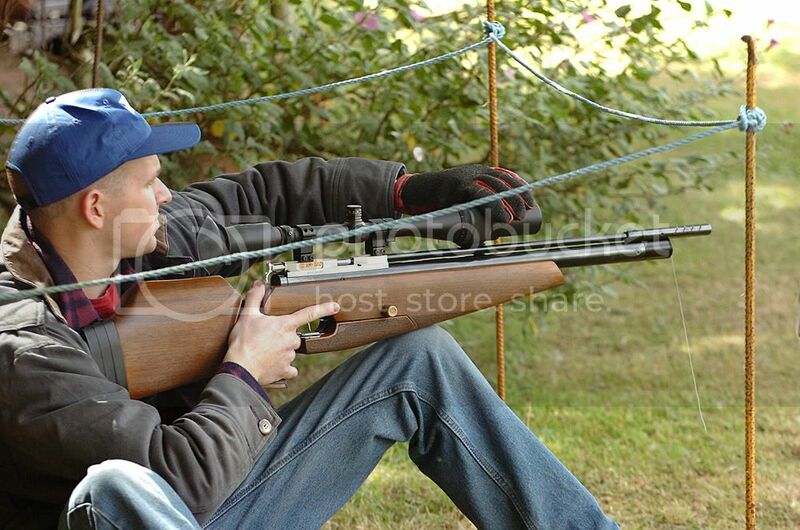 I told Jon Harris on the plinking range it was a course for him, and it was. Once again, high wind, a high score. Yet it was a regular master, Andy Calpin that won the day with a 38, and there were several strong scores from the rest of the grades as well. But Andrew Gillott had done enough on the day to keep his rivals at bay, and he takes the AA BFTA 2009 title, which he has clearly worked so hard for all year, you can't say he didn't give it his all (even with people trying to knock him out of the running )... throughly deserved. 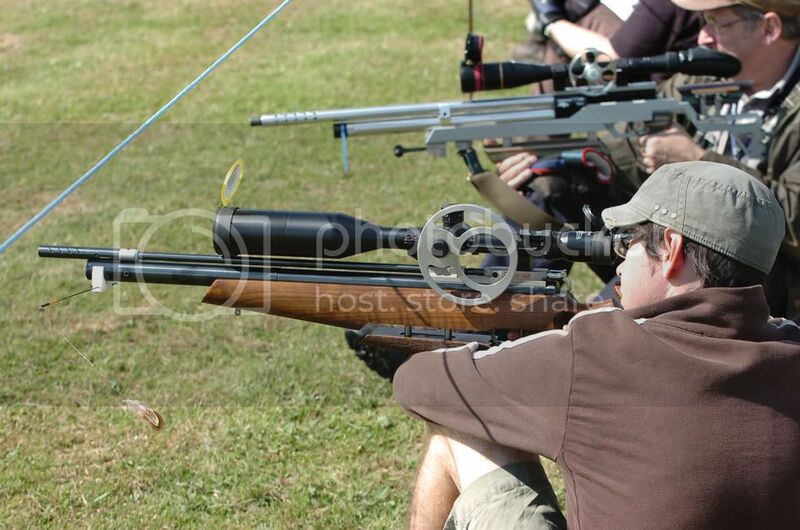 After the shoot, while stories of the course were exchanged, the rest of the titles, trophies and £4000 of prizes kindly supplied by Napier of London, and Blackpool Air Rifles were handed out. In A, Ian Stoddart had only got one trophy before this all year, but his efforts to get consistent high scores had paid the way for the overall win. 5th-9th were again seperated by a few points. And whilst I know some A graders are fearing the leap to AA, there will be some AA's fearing their arrival! In B, despite Simon Higgins winning with a stunning 292 points out of a possible 300, Scott Robinson pushed him all the way and was only 12 behind... having only done 6 GP's he wasn't able top drop a single score. No pressure. 4th-6th again was down to the wire. In C, Ian Harford changed tack from SFT after GP4. I'm thinking that perhaps some wished he hadn't. In the 6 remaining GP's he scored 288 out of 300, with barely more than 15 points seperating those in 2nd-5th. Tight placing seems to be the theme of the year. Nick Murphy had just 2 points over Mark Fisher who did just 6 GPs, winning 4 of them, often beating most PCP shooters. He proved the point about kit admirably (but hankers after his Ev2's trigger). Brian isn't happy following the crowd and stamped his authority on SFT early on... sadly missing out of qualifying for the showdown. But the SFT shooters have really impressed this year, and again demonstrated that kit isn't everything, so perhaps the qualifiers are quietly relieved. I think I've shot with a few of 'them' and every time have thought just how difficult it would be to me to do what they seem to do with ease. Check out their scores relative to us knob twiddlers. Back to tight finishes again for the Silhouette series. 120 possible, 1 shot between Andy Calpin in 1st on 101 targets hit, and John Costello in 2nd with 100. James Woodhead 3 shots behind that, equal scoring with Neil Daniels in 4th. Phil James in 5th on 88 had equal scorings down to 7th as well. For me, my nails went on the Team Championship. I really hoped this year it would be Walther's (i don't think anyone escaped that emotion) but I also knew it would be a hell of a fight, and it certainly was. We lost one, won one, lost two, one three. But we needed another win, and just when we wanted it, Air Arms Team 1 took it cruelly away from us. Despite 3 losses in a row, they weren't rolling over. So it went down to the last GP. AA team 1 put in an excellent morning session, Calpin with the winning score, Phil and Dave with strong performances. Walther just had Neil's strong 36 to follow. On the back foot, we needed to surpass the opposition's morning efforts, or hope that both James or Steve couldn't keep up. That's not something you put money on, and as I saw our teams's scores being ripped through our fingers, I could only imagine we would finish in a devastating fashion, like one shot shy of a win. But it wasn't to be. Sywell savaged Steve and James, and they were 5 targets and 3 points adrift. Also of note were the new Steyr team, who took 3rd off AA team 2, and narrowly missed out of pushing AA Team 1 into 3rd on the day... and it wasn't the first time that had nearly happened in the season. So, capacity shoots, down to the wire, high wind, low wind, long, short, wet and dry, hot and cold... that was the BFTA 2009 GP series. There's too many people to thank individually, the sponsors, the BFTA, the regions and clubs and the shooters, all who have attended. It's all made it another classic year to remember. So thanks. I may have spat feathers on a few lanes, and I think my toys are probably over the otherside of the A43... but it's been fun all the way. After that i'm off to the Worlds... so have fun at the Euros. Cheers best mate, chased you all the way well done you deserve it ! Chuffed to make the Showdown see you at Europeans best mate ! And this please? I ask as they have class Guns!